Common to California gardens are the small orange/gold, brown and black butterflies known collectively as the Skippers. 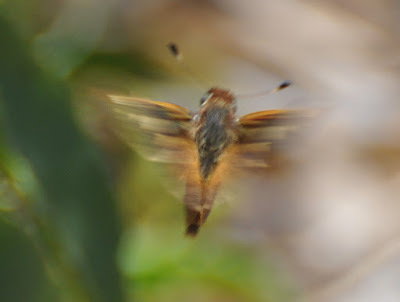 The Skippers, in the family Hesperiidae, are best viewed as ‘sisters’ to the rest of the butterflies . They generally have short, stocky, hairy bodies, a large head with hooked antennae, relatively small pointed wings and a rapid ‘skipping’ flight pattern. The green caterpillars, which have a large head, are also distinctive. There are at least 3500 Skipper species world-wide (about 250 native to North America). We discussed one group – the Duskywing Butterflies (genus Erynnis) – previously (http://mother-natures-backyard.blogspot.com/2015/05/duskywing-butterflies-genus-erynnis.html). The sub-family Hesperiinae - the folded-wing skippers – is well-represented in California. This is the largest Skipper sub-family, with over 2000 described species world-wide. 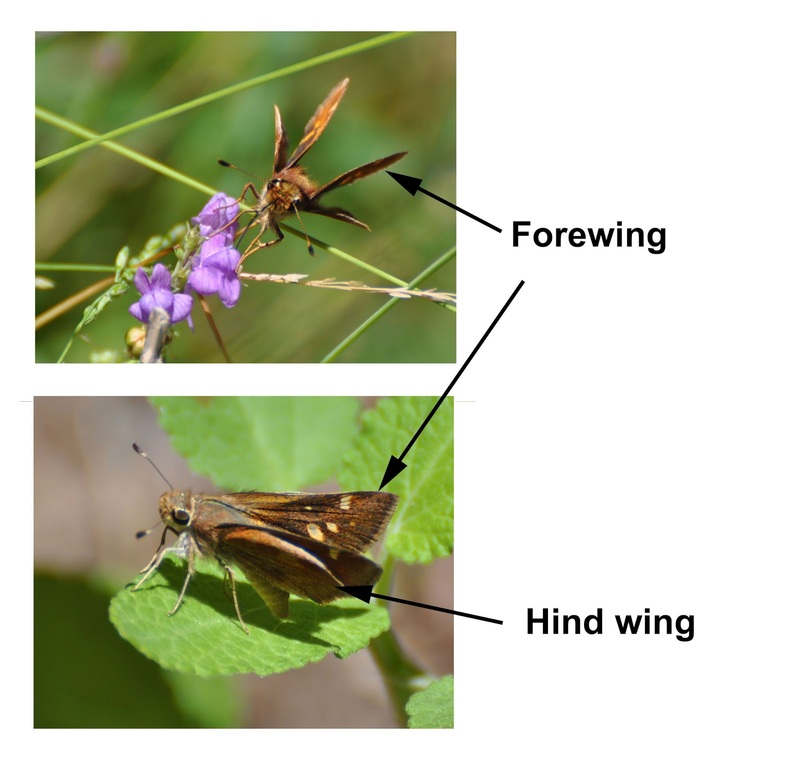 Unlike the Duskywings, this group perches with its wings either folded or with the hind wings flat and the forewings partially closed, giving the appearance of double wings. Hesperiinae larvae (caterpillars) feed on grasses and sedges, hence the common name ‘Grass Skippers’. 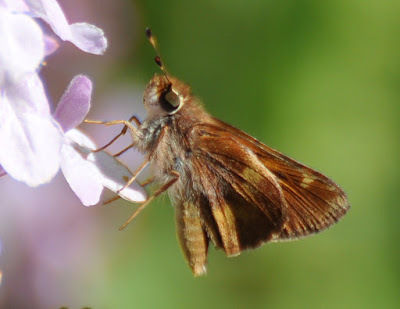 A locally common representative is the Umber Skipper, Poanes melane, which frequents many gardens containing native or non-native grasses and sedges (even lawn and weedy grasses). 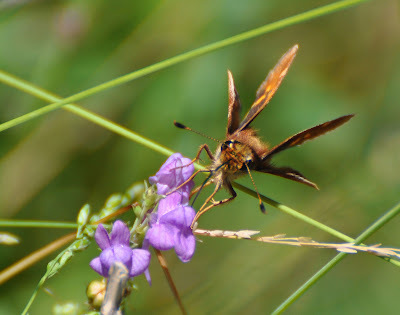 Umber skippers are relatively small – about 1 ¼ inches (3.2 to 3.5 cm) across. But they do perch regularly, allowing you to view them even without binoculars. 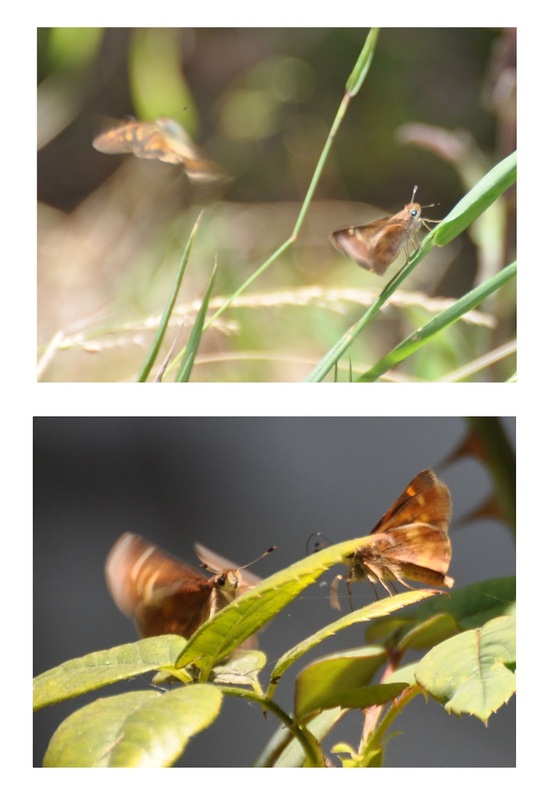 If you’re patient, you can take good photographs of Umber Skippers. Once you recognize them, you’ll realize just how common they are in our area’s gardens. 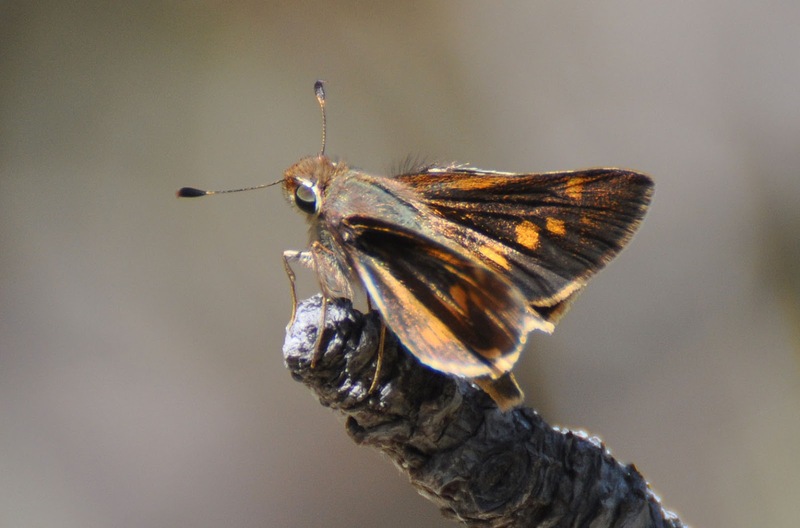 Umber skippers range from western California (west of the Sierras) into Baja California, and the highlands of Mexico and Central America. The California type (ssp. melane) is limited to western CA (from Northern CA [Monterey County] south to the Mexican border) and Baja California, Mexico. The range of Poanes melane appears to be expanding northward in California, perhaps due to the availability of grass lawns and possibly due to climate change. [2, 3] Umber Skippers were apparently unknown in San Diego County until the 1930’s . Poanes melane melane was proposed as a sub-species by none other than William Henry (W. H.) Edwards, in 1869. Edwards was a famous butterfly expert of his time. He wrote the three-volume Butterflies of North America (1868-1897), called "one of the most important entomological publications of the 19th century." Edwards was particularly interested in morphologic (physical) differences within a species and the role these play in the development of new species. Poanes melane certainly demonstrates morphologic variability within its range. We were surprised by the limited research on the taxonomy and natural history of Poanes melane. For such an interesting butterfly, relatively little is known about its classification and life ways. 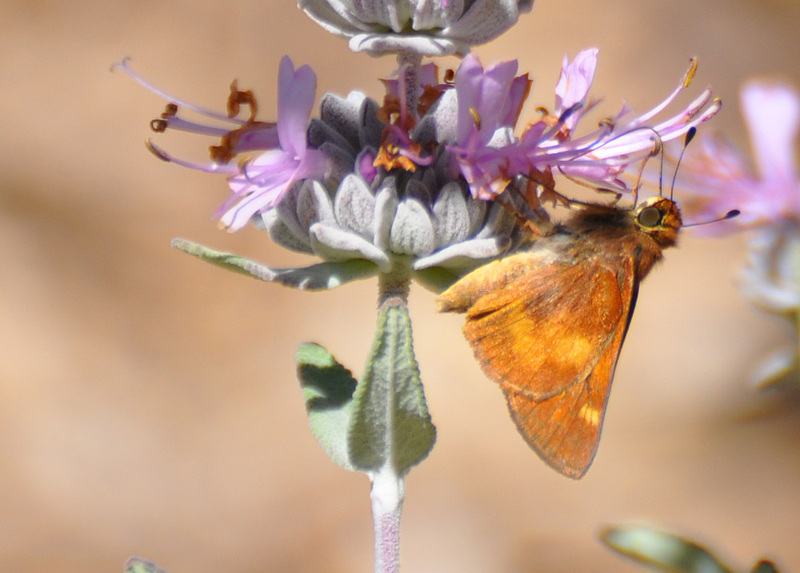 This species presents a ripe field of inquiry for a graduate student interested in Southwestern butterflies. 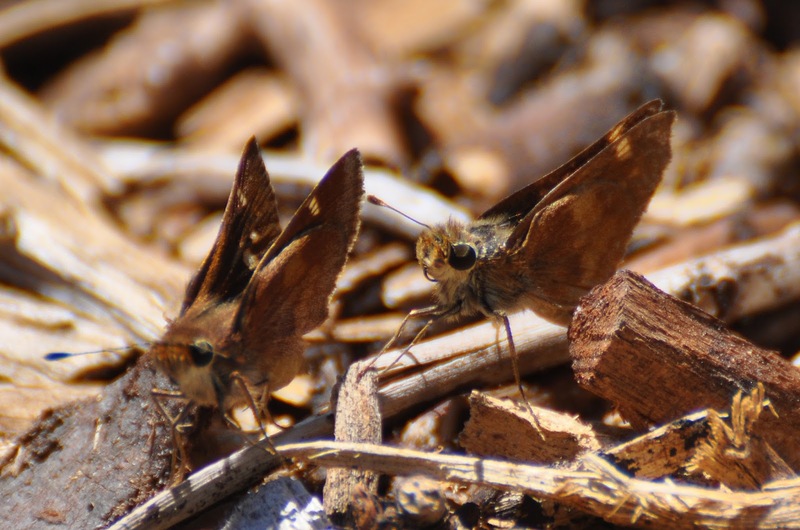 Umber skippers are best known (and named for) their most obvious feature – their overall umber color. 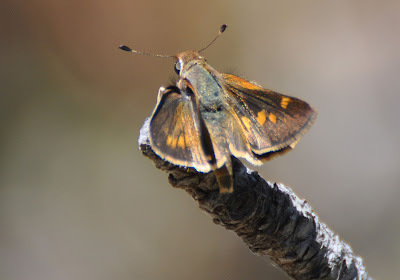 Among local folded-wing skippers, this is the darkest appearing; the rest are either more orange or paler. The males are said to be smaller and darker than the females, but we can’t claim to tell the difference reliably. We do see quite a bit of variability in our own gardens (see below). This may in part be due to sexual dimorphism; we also suspect that individuals lose some of their bright coloring as they age. The brightest Umbers are most common early in the season. The darker ones are more frequent later; these have often lost much of their juvenile ‘hairiness’ as well (see below). They blend in quite well with drying foliage. When viewed more closely, the upper (dorsal) side is primarily umber brown, although sometimes the color appears almost black-brown. The forewing, which is often easiest to view, has a line of three small lozenge-shaped patches near the edge. These are usually a bright yellow-orange, but may be almost white. They are quite distinctive and easy to spot. There are also a series of larger, yellow-orange splotches nearer the body. These form an irregular line or band. The hind wing has a light, yellow-brown band, which is distinctive in this species. The narrow wing fringes are a pale tan (see above). 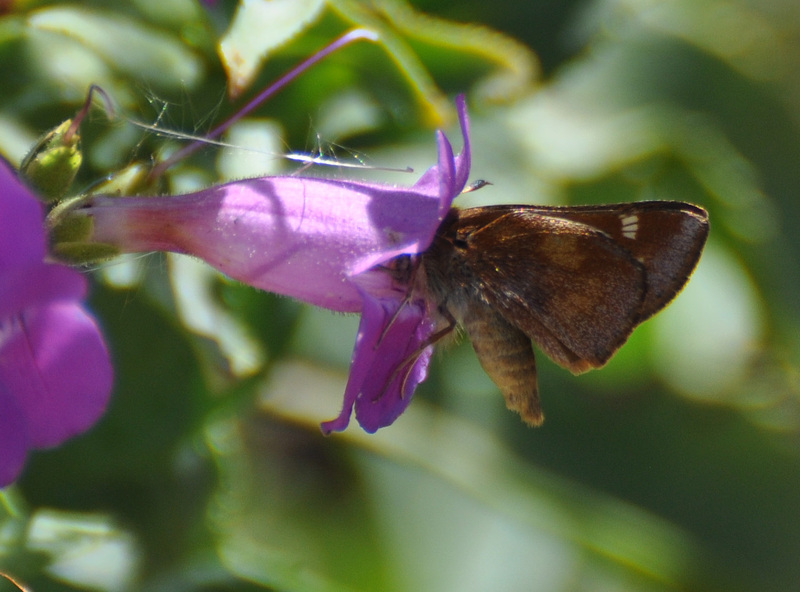 The lower (ventral) side is often easy to view when Umber skippers are feeding. The ventral side wings are lighter, with an umber background and paler orange (to white) blotches. The blotches form a distinctive v-shaped band, which is often described as unique to this species. The antennae are approximately 1/3 the body length, spreading out and slightly forward; they have the slight hook at the end that is typical for Skippers. The entire body is quite hairy. The hairs atop the head are umber; the ‘face’ and area around the eyes is white (see above). 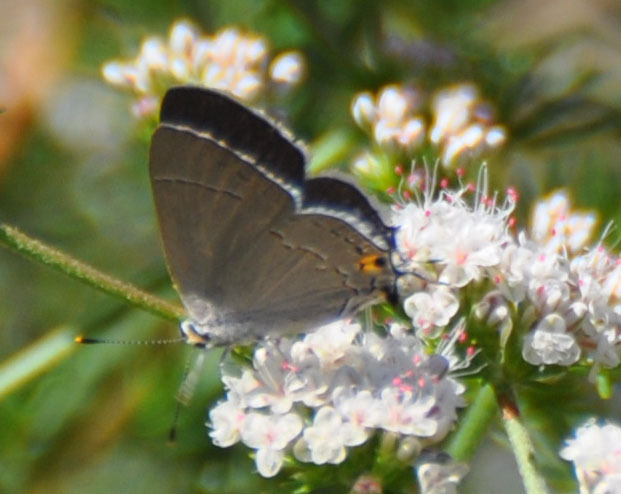 The hairs on the underside of the body are often also gray-white. 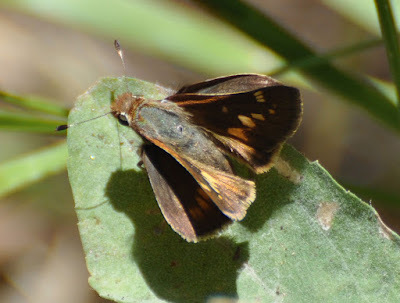 Umber Skippers can be seen anytime from spring (usually March) through fall (October), but they are most common locally in the hot, dry days from June through September. They have several broods a year , one in spring and another in late summer/fall. 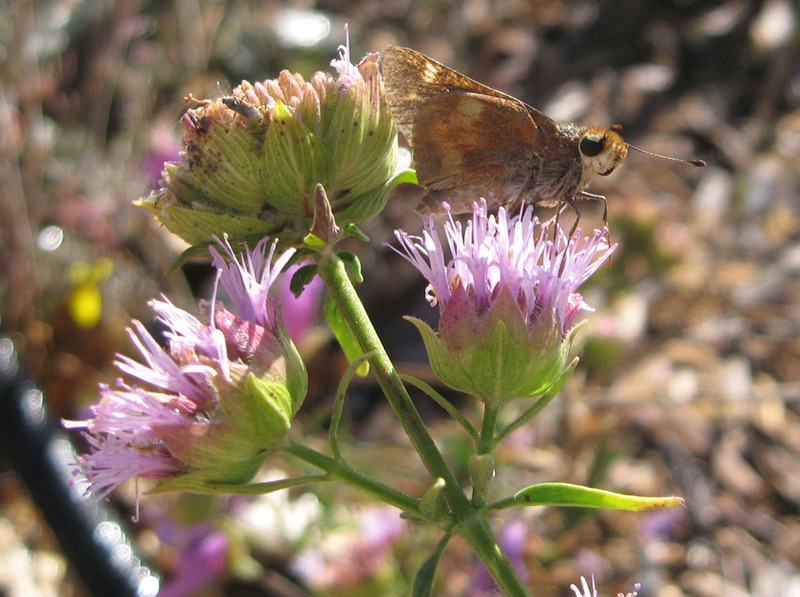 From our experience, Umbers are common butterflies in the Los Angeles Basin. In the wild, they live in shaded canyons in the foothills and Oak woodlands. 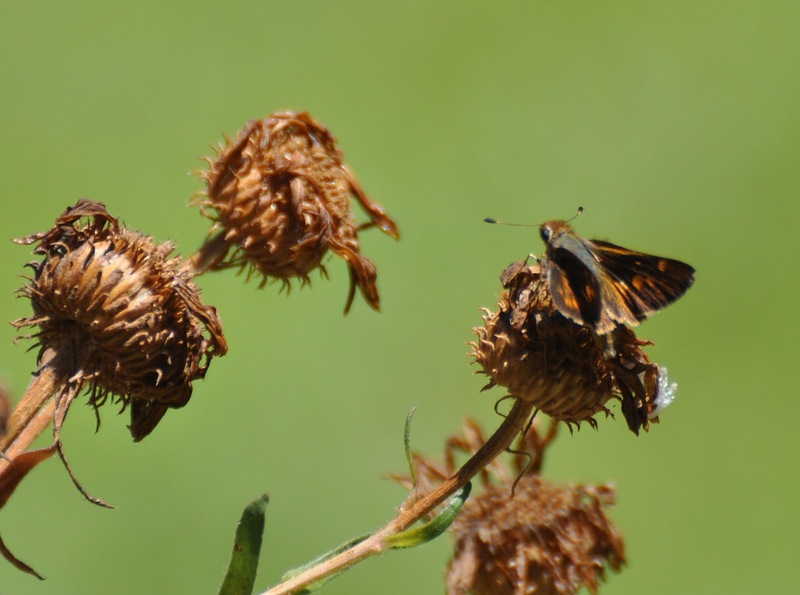 They can also be found in grassy areas in Preserves, parks and gardens, often near water. We were surprised that Umbers are uncommon in Orange County suburbs . This has not been our experience; we see them regularly in western Los Angeles County, particularly in gardens with native plants. 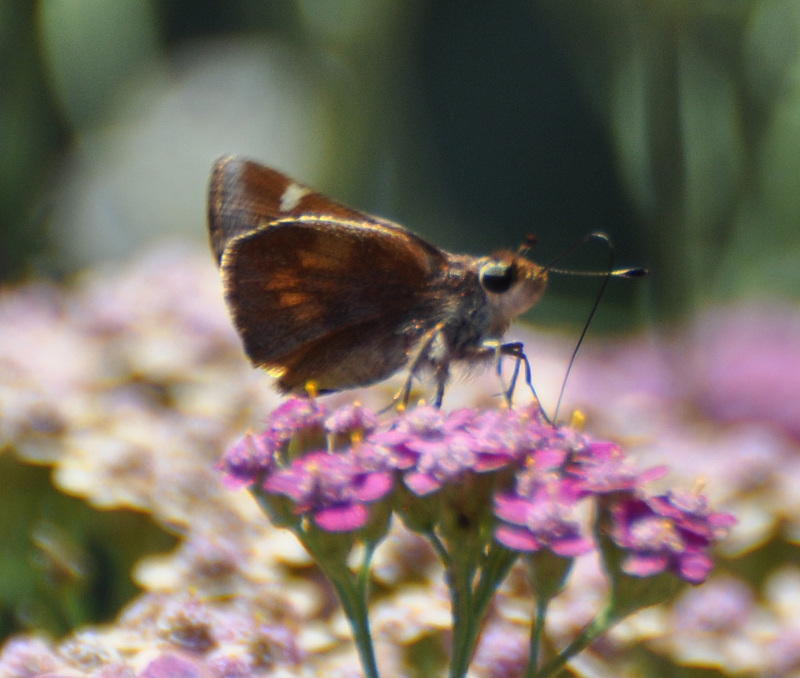 Adult Umber skippers feed on floral nectar, primarily from plants in the Sunflower (Asteraceae) and Mint (Lamiaceae) families in our gardens. 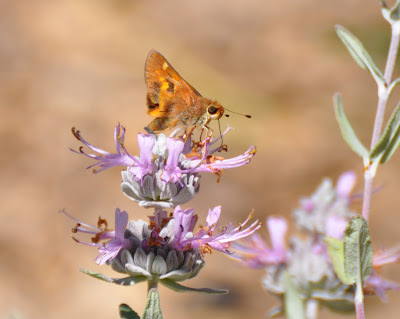 We commonly see them on Yarrow, Asters, Gumplants, Goldenrods, native Sages (Salvias), mints and Monardellas. 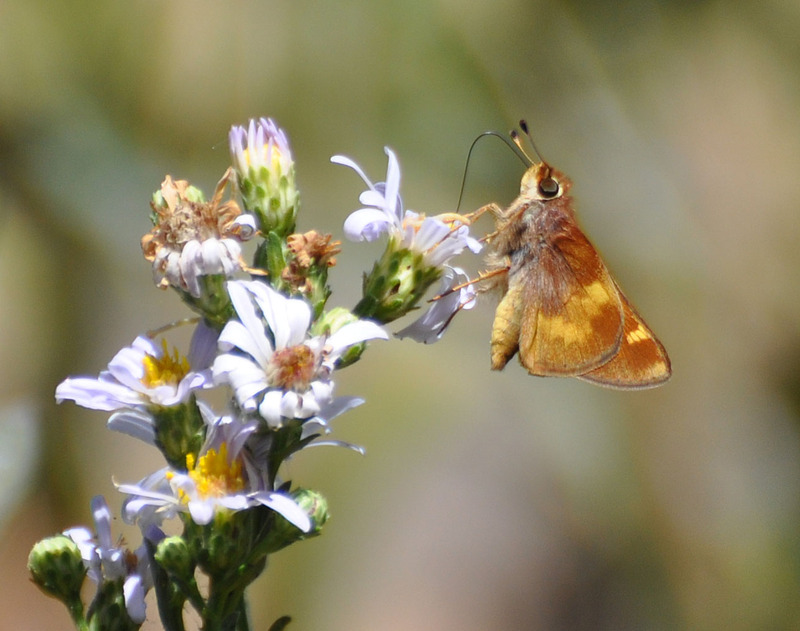 It’s not unusual to see several Umbers on a single flowering plant – or Umbers nectaring with Fiery (Hylephila phyleus) or other Skippers. Umbers are quite tenacious in their quest for nectar (see above); we’ve seen them hanging upside-down – even entering tubular flowers like the Penstemons. When not nectaring, males can be seen perched near grasses, waiting for receptive females. We have observed female Umbers rapidly circling a perched male, a behavior that’s easier to observe than to photograph. Males will also dart out to inspect potential mates. We’ve tried photographing the Umber’s mating ritual many times – with less than optimal results (above). The perched individuals appear to be male; the circling individuals appear to be larger and brighter females. We’ll continue to observe and update with new insights into Umber behavior. 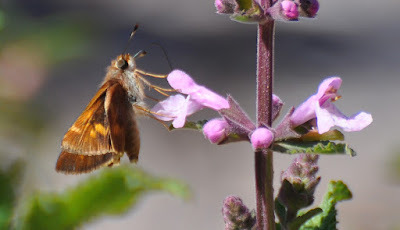 We’ve also seen Umbers chasing off other individuals, mostly Umber and other Skippers, in what we assume to be territorial behavior. Several to a handful of individuals will also sometimes chase upward in a spiraling pattern. We’re not sure whether this represents courtship or other activity. Perhaps someone with more knowledge of Skipper behavior can enlighten us? Larval food sources are a range of native and non-native grasses and sedges. Raymond Barbehenn  suggests that the only limitation may be the toughness of some grass species. Caterpillars did not grow on the tougher grass species, such as Deer grass (Muhlenbergia rigens), which they may not be able to digest. Umber larvae have been observed eating a wide range of common lawn and weedy grasses including tufted hairgrass (Deschampsia caespitosa), Bermuda grass (Cynodon dactylon), California brome (Bromus carinatus), and sedges. 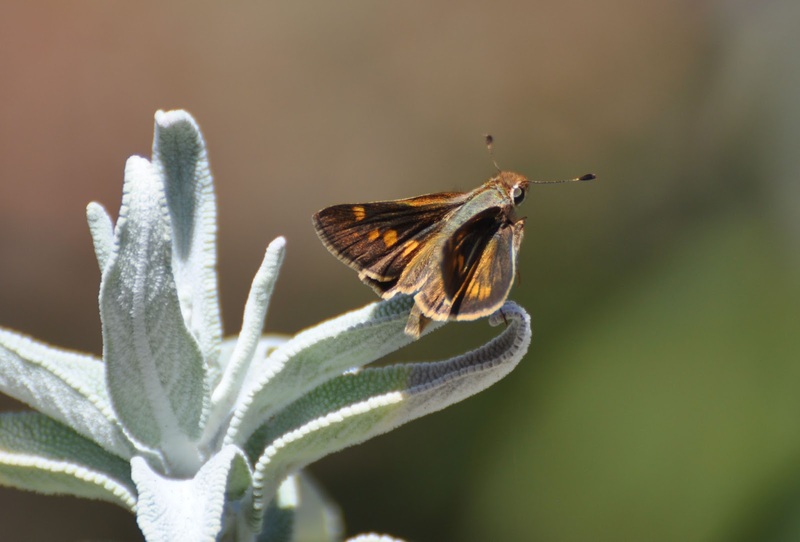 We hope we’ve inspired you to search for – and observe – this interesting Skipper species. There’s much still to learn about this little butterfly. Perhaps you’ll discover something new – right in your own backyard! Calhoun, John V. (2013). "The Extraordinary Story of an Artistic and Scientific Masterpiece: The Butterflies of North America by William Henry Edwards, 1868-1897" (PDF). Journal of the Lepidopterists’ Society 67 (2): 67–110. Many of us are looking inward in 2016, reflecting on our motivations, actions and responsibilities to others. These are important steps; somehow, we must work together to solve the challenges of our interconnected world. Harmony, cooperation, thoughtfulness and positive actions are needed in times like this. Times of change also remind us of our sacred role as land stewards. Urban dwellers sometimes forget they are part of larger ecosystems. But our actions – good or bad - effect the lives of many species, in addition to our own. 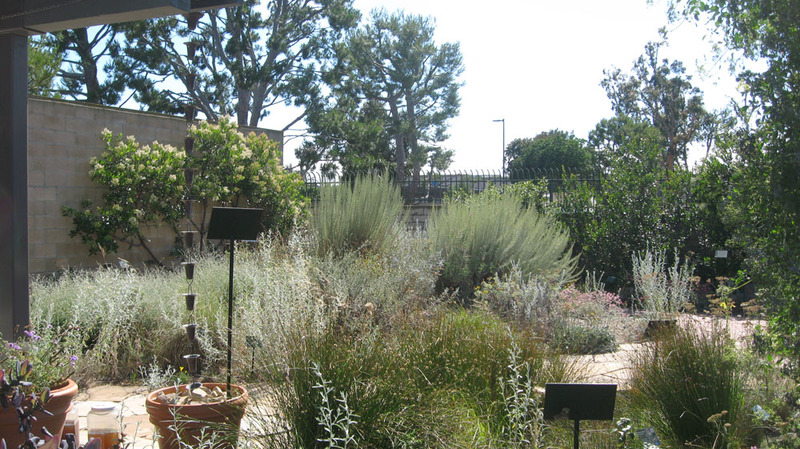 We’ve recently been reminded of the importance of gardens in times of drought. The signs of S. California’s worst recorded drought are all around, in brown lawns and sick/dying street trees. The effects are even more dramatic in the wildlands - and it’s not just the plants that are suffering. Even some ‘common’ native butterflies and other insects are just not out there in the wild this year. Drought means no water and no food. And so these creatures flock to our gardens, desperate for a meal and a drink. Gardens are a sanctuary for many creatures this year. 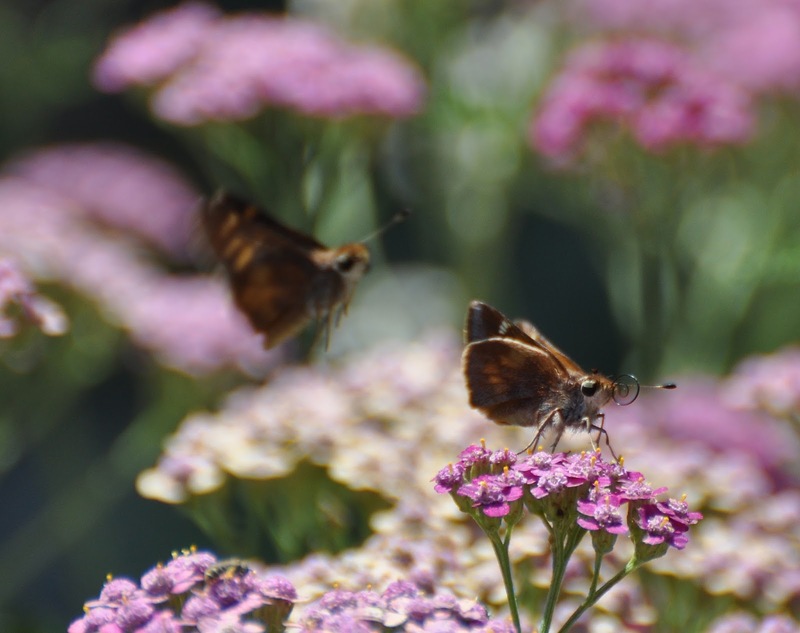 It’s no surprise that naturalists have noted increased numbers of birds and insects in gardens this summer. These observations are supported by data from recent bird and butterfly counts. Our gardens are truly a haven of last resort in times of drought. Climate change forces us to rethink our gardens. In addition to choosing plants that can survive, we should consider those that provide something extra. That ‘something extra’ can be a sweet aroma, food or flavorings for the table, herbal medicines or habitat for native creatures. 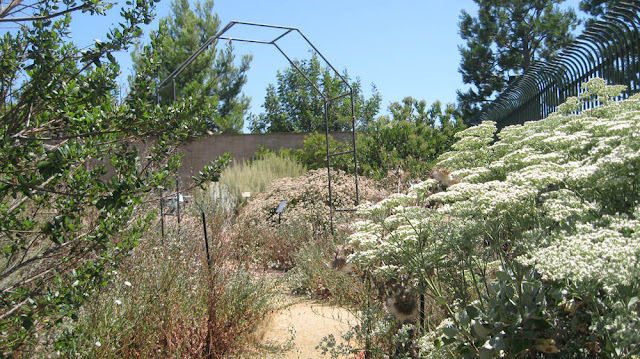 Fortunately, many California native plants provide many ‘extras’ (in addition to being drought tolerant). 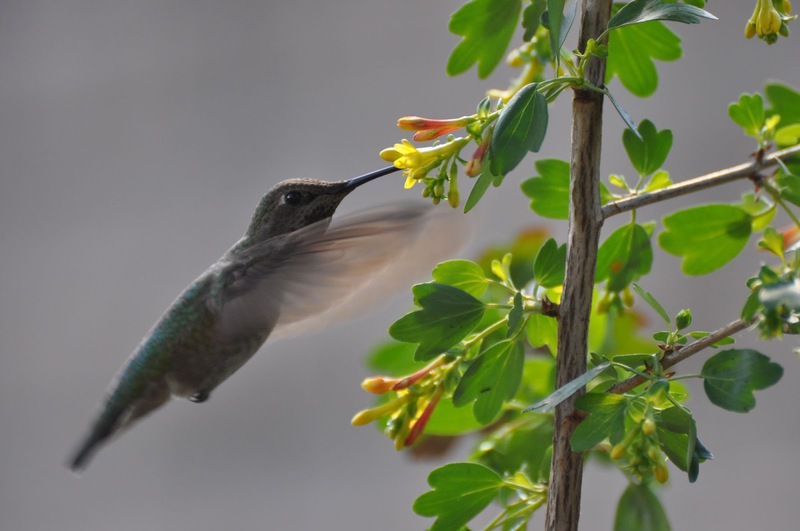 Gardens that include native plants simply offer more benefits. Whether just a few pots on a balcony – or a plot of several acres – your garden can be a place of refuge for plants, humans, other animals, insects and others. You have the luxury of providing a little bit of water – even if the amount is restricted. And that makes all the difference, in times of drought. So let this be a year of introspection – but also a year for positive action. Resolve to make a difference in the community where you live; and don’t just limit your vision to the human species. Learn more about the ecosystem in which you live. And don’t be surprised to discover new meaning and direction along the way. Get out, start thinking, get going; the time for action is now. A bit of mindfulness can transform each of us into agents of positive change. And the cumulative effects of positive actions, no matter how small, can truly make a difference in challenging times like this. Southern California gardens are home to a number of interesting insects, from butterflies and bees to tiny wasps. 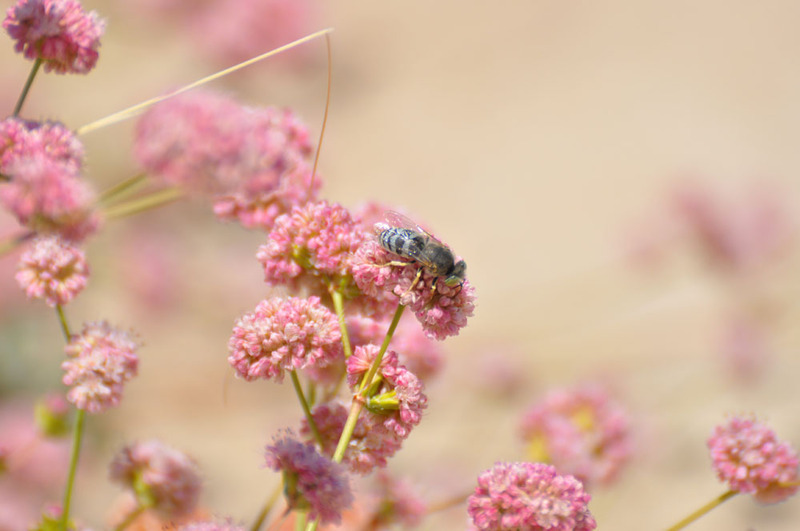 We try to feature these insects on our blog. Below are the insects we've blogged about as of August, 2018.